What makes a leader truly great? In this book, Simon Walker reveals the secrets of greatness. Drawing lessons from the lives of Gandhi, Martin Luther King, Churchill, and other "greats", he reveals the source of the leader's influence and authority. About "Leading Out of Who You Are"
Leadership involves power and influence over others - but each of us is trapped by a psychological imperative inside us to use whatever control we have for our own ends. Where does this imperative come from? From our sense of self, formed during our childhood, which is the source of our drives and fears. The author describes four ego patterns: Shaping, Defining, Adapting or Defending - and shows how they determine the needs we try to meet in our lives as leaders. Our natural instinct to use our leadership to meet our own needs rather than others' is what he terms `defendedness'. One strategy of defended leadership is to build a `front stage' and a `back stage', which allows us to reveal or conceal aspects of our self according to how threatening we perceive our audience to be. While the best human audiences (in secure relationships, loving marriages, deep friendships and so forth) can go some way towards fulfilling our need for unconditional and dependable approval, ultimately we need to locate a spiritual source of approval if we are to be fully available to serve others freely. Study questions and exercises, as well as leadership tools and an online community, help readers to discover ways to develop greater undefendedness. 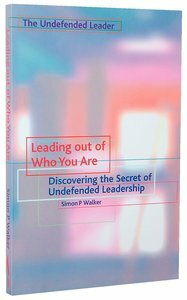 In this first volume of his 'Undefended Leader' trilogy, Simon Walker shows how sustaining a front and a back stage derails many leaders and explains how leadership egos formed in childhood creates 'defendedness' in a leader. Walker defines 'undefendedness' as the only true source of freedom for a leader and gives practical guidelines for achieving it.